Eleven pageant experts and supporters voted in the second round of our Miss South Africa 2017 leaderboard and this time it was Demi-Leigh all the way. With 47 points, Demi got double the points than Shelbe who received 23 points. Nompumelo was our judges choice for third place with 21 points. Kayla and Iman both got 15 points, but Kayla was awarded #4 as she had 2 votes as the runner-up to Miss SA compared to a single vote for Iman to be the runner-up. Abongile (South Africa), Gian (USA), Greg (Belgium), James (Hong Kong), Jean (Belgium), JT (Philippines), Lanel (South Africa), Lex (Philippines), Marina (South Africa), Sally-Ann (United Kingdom) and Sifiso (South Africa). 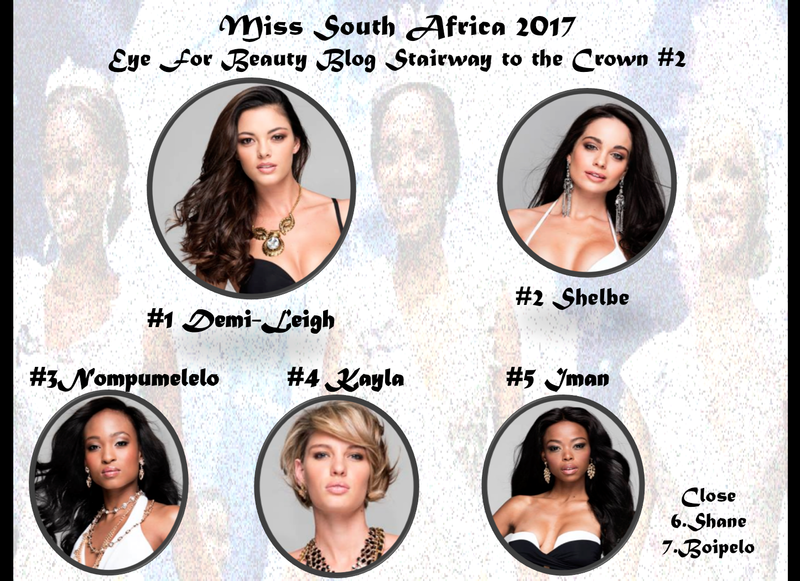 Eye For Beauty Blog would like to thank our judges for Miss SA 2017 Stairway to the Crown #2! I am surprised Yuti is not in the Top 5 and Iman slipped to 5th!! !